Spring is around the corner, and you know what that means! 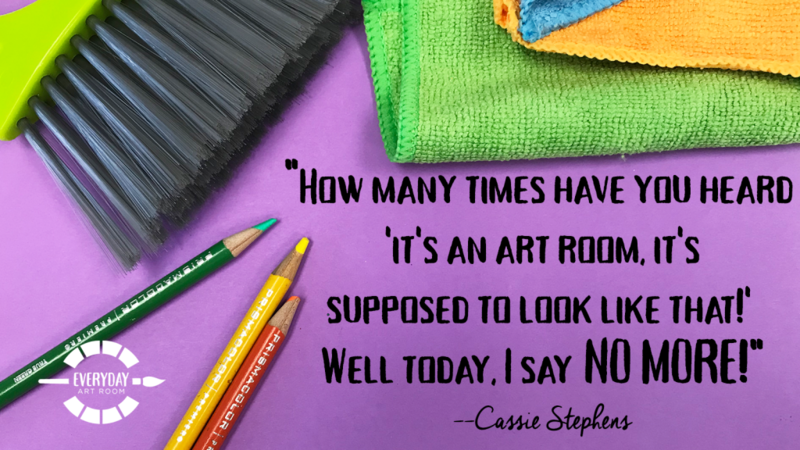 It’s time to organize your life, and unfortunately, your art room closet as well. 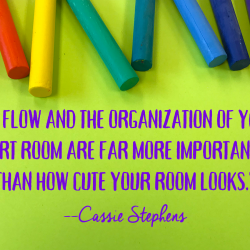 In the middle of her annual cleaning party, Cassie talks all about organization, including why you need to empty everything out (8:15), the random oddities you’re going to find when you’re organizing (11:45), and the supplies you need at both home and school (16:00). Full episode transcript below. I’m often asked the question how I manage to find as much time as I do to get all the things that I appear to accomplish, done. Well, let me first just start by saying that everything you see on blogs, and on Instagram, and any social media platform is about I’d say, 90% smoke and mirrors. I mean, when I share things on Instagram, sometimes I’m sharing things that I’ve created a while ago. Don’t think of it at something that I’m just churning out overnight. I’m actually a really slow worker and I have a very special knack for starting 25 projects and only finishing about one every blue moon. When I do manage to finish one, it appears that I’ve magically done it overnight. But the true key to my time management, here is the key, the absolute secret, all you have to do is just completely shirk all adulting responsibilities and, magically, you will have all the time in the world. Namely, if you give up organizing and cleaning for any length of time. You’ll have all sorts of times to knit yourself a 12 foot rainbow scarf, as I recently did, and you know, needle felt the living daylights out of any article of clothing in your wardrobe that just needs it. There you have it. The true key to having a bunch of time on your hands. Now, I will say after about 15 years of doing this, particularly in the space where I teach art, it’s now coming back to bite me in the ankles. Ankles. It’s what I said. Here’s why. I live in squalor. I know by the pictures you see on my Instagram, it might not look that way, but I recently shared a picture of one of my storage closets. That’s right, I’ve got two and a kiln room and office but I digress, they’re all a hot, flaming dumpster truck, full of mess and it’s now starting to come back at me. So, I will say that if you’re going to shirk all adulting organizing and cleaning responsibility, eventually you’re going to have to pay for it and you’re going to have to clean it up. And what better time, than during the spring? So, let’s talk about it. Let’s talk about spring cleaning for the unorganized, hot mess, anti-adulting, art teacher. Hopefully, I’m not alone. This is Cassie Stevens, and this is Everyday Art Room. So I’m a little bit of a self-help book hoarder, which makes perfect since especially the hoarder part. The only problem with being a hoarder of self-help books is that you would think that you would eventually get around to reading one. I’m really great at starting these books, not so much with finishing them. But, I will share with you today, a couple of books that I read in an attempt to try to figure myself out, unravel the puzzle that is this hot mess and try to figure out organizing. So of course, let’s talk about that one book that really was popular about two or three years ago, I think just about all of us read it or, were at least familiar with this book, “The Life Changing Magic of Tidying Up” by Marie Kondo. And, I come to you sitting in a sewing room filled to the brim with stuff. None of which is tidy. Obviously, this book worked wonders for me. Hey, nothing against the book. Actually, a great book. It did really get me thinking quite a bit about how to organize. I just never quite got around to the actual doing part. Here’s a couple of things that kinda tripped me up. Thing number one, one of the main keys of the book was you’re supposed to hold any object, any and all objects basically, that you have in your possession. And, you’re supposed to decide if that object brings you joy. Just looking around the room that I’m actually sitting in. If I were to physically touch every single thing in this room and decide, “Does this bring me joy?” Y’all, I would be sitting here until I was 92. Same with every storage closet in my art room and cabinet. I just can’t fathom that and for that reason, I think reading that book really overwhelmed me. And, to be honest, if I get overwhelmed I just shut down and go back to making very large scarves. So that, was one thing that kinda tripped me up about that book. Another book that I read and both of these books I’m about to recommend strongly. Another one I read was, “Better Than Before” it’s by Gretchen Ruben. In fact, me and my buddy Patty Palmer, she also read this book and we had a chat about it. I love this book because, it basically says there’s four types of people out there in the universe, and let me share with you what they are. There’s the Upholder, the person who’s just basically always going to do anything that’s been asked of them to do. They’re just going to uphold any sort of duties. They are basically the quintessential adult. Pretty much the furthest thing from most of us art teachering types. There’s the Questioner, which is a little bit more like we art teachers, where they will uphold something but only after asking you a whole bunch of questions to make sure that it actually makes sense with them. And, just their life goals, I guess. There’s the Obliger. The person who’s just going to go out of their way to please you because, that’s just the kind of person they are. And then, there’s the Rebel. Who just basically, don’t do nothin’ unless they absolutely feel like it. So guess, which one most of us are? Patty and I both discovered that we were both the Rebels and I’m sure a lot of you guys, if you’ve read that book or, if you’re listening to these descriptions, you’re probably are thinking. “Yeah, that fits me.” Well, here’s the great part about “Better Than Before”, she has no suggestions for you in that book. She pretty much says, “It’s awesome that you’re a rebel but, I can’t help you. Move along.” So, those are two books that I really enjoyed reading but, didn’t exactly find to be 100% beneficial and therefore, two to three years later, having read those books, I find myself in the same position I was before. So technically, I should write a book called, “Same As Before”. Anyway so, let’s talk about what to do. What are we to do with this rebellious, unorganized nature that a lot of us find ourselves that we are, if I’m making any sort of sense, which I know I am not. But, bear with me. We’re rebels. Let’s stick together and let’s figure out how to get our lives together, y’all. And mainly, how to spring clean and organize these closets. I’ve got three tips for you and let me just say, I’m sharing these tips with you as I am in the midst of cleaning, purging and trying to make sense of the space that I both live in and teach in. So, here are my three main tips. Tip number one, I think Marie is actually right. But, I think you have to empty it all out. For me, that means my storage closets. I might not be able to go through and physically touch every article in my art room storage closets. But, I do think that I have to physically touch, move and decide what to do with those objects. I might not be able to contemplate how much joy each one brings me, but I do need to decide what to do with these things and make room for all the stuff that I have. So, here’s my plan that I just started this week, we’ll see how long this journey lasts and I will definitely keep you posted. I’m all about starting stuff, just like those books. And again, just like those books, not so great at finishing them. So, I’m telling you this because I feel as though if I put it out there in the universe, I’m going to have to actually hold myself accountable. So, here’s what I’ve been doing. I am going to try to go into school one to two hours, probably realistically, just one. Earlier than I normally do, just so I can start pulling things out of my storage closets and going through each and every bin, box, everything and just slowly start … To start getting rid of stuff. I’m also, staying a little bit later if it works for me. But I actually really enjoy going in, in the morning. I used to be this awesome morning person, not so much anymore. But, I do really like how quiet the building is in the mornings, and I feel like I can get a lot more things done without interruption. Another thing that I’ve been doing is kind of recruiting help. I am not organized by nature. I have a really hard time even thinking that way. However, if you reach out to people who are, I think you’ll find that they naturally have a knack for it and there’s some people who enjoy this organizing thing. So, finding those people, those friends, parents, even students, can be really helpful. I’m recruiting, so if anybody would like to volunteer, I am taking volunteers. I can pay in chocolate and coffee unless, you are under the age of 10. Here’s one thing that I’ve noticed as I’m going through my storage closets, pulling every single thing out. I’m finding stuff. And one thing that I keep finding that really frustrates me, is I’m finding duplicates of things. Things where I could not find that packet of needles, or that special kind of thread, or those pipe cleaners that I really needed for a project. I knew I had them. I had no earthly idea where they were. So, what did I do? I went out and purchased another set. So many duplicates of things, scattered all over different closets. It’s so frustrating. But now, I’m making sure to compile them all so that I don’t have this duplicates problem again. And, I’m also finding that I have exactly one million trillion of the following: Popsicle sticks, so many Popsicle sticks you guys. I mean, thousands of Popsicle sticks. I’ve got so many bins of beads. And let me just tell you, when those things hit the ground, I dropped, at least it was small jar today and I think they multiple as they bounce, I really do. There’s a science to it, I know there is. Pompoms and feathers. Do these things somehow multiple inside my storage closet? I’m thinking that my closet is not the only one where these things multiple. And then, just like the random oddities. I was given two 25 pound bags of Mardi Gras beads. Y’all, there’s no amount of hand sanitizer that can disinfect two 25 pound bags of Mardi Gras beads, those had to go. Just the randomness that I’m finding, and I’m not having any trouble at all saying. “This is not bringing me joy.” And just immediately throwing it out or, separating it into my yard sale bin. That’s right, we’ll get to that next. So, let’s talk about that. Have you guys ever watched Hoarders? This is a show that when it first came out my husband was like, “Oh, have I got a show for you. This show has you written all over it.” But you guys, if you’ve ever watched the show it’s actually, very stressful and a lot of times, heartbreaking. I noticed on that show, that they have the folks have three giant kind of boxes, or three piles and it’s Keep, Trash or Donate/Sell. So, I’ve been doing the same thing. I’m trying to compile all my Keep stuff. Like I said, I’ve got things scattered. So, I’m putting all the yarn into one area, and I’m trying to compile all the fabric into another area, before I start to really go through it all. The other thing I’ve been doing is just, filling up my trash cans. I’m finding little odds and ends that just don’t make sense. I have a real problem with getting rid of things. But, when it comes to like, three dried up fabric markers, girl why you still have that? I mean, some of these things have labels on them that are definitely vintage and, I’m not talking cool vintage I’m talking like, 1986 Puffy paint, weird stuff. Let it go. Now, I have decided … This is going to make me sound extra crazier, that I am going to have the world’s giantess yard sale this summer. And, I will be selling all the things that actually, I’ve deemed ‘worth something’. And, what do you think I’m going to do with that denaro? Oh, you know I’ll go out and buy some more junk, hopefully not. Probably bins to put the more junk in. But, I have been creating these three piles and, it’s working for me. Another thing I would recommend is, when you starting putting things away. I mean, you physically do have to take everything out and, you really do have to go through everything. But, when you’ve done step one and step two, and you’re ready to put it back into your closet. Don’t put it back in the same way that you took it out. And the reason I’m saying that is because, if you’re like me. I am kind of a, stacker. I’m also one of those people … My shelves are very deep in my storage closet so, I’ll put things in the back and then, I’ll stack things in front of them. And then, the next thing you know, I can’t find what I’m looking for. Or, I’ve forgotten what’s in the back, and I’m too stinkin’ lazy to pull out what’s in the front to find out what’s in the back because, I don’t have time because, I’ve kids to teach. So, what I’m trying to do now is to make it so that I can see everything very clearly. We’re visual people. Clear bins, I think is the best way to make that happen. However, that can add up and right now, I don’t feel like dropping any change on my storage closets. So, I am just using what I have and labeling the daylights out of things. However, clear bins would be ideal, and I’m not stacking. And, I’m not tucking things away. No more putting a smaller box inside of another box like Matryoshka dolls, that’s what I have in my storage closet. Just, these Matryoshka dolls of messes basically. The other thing is, I want to make sure everything is easy to access. Go in my storage closet, grab it. No digging, no rifling. And easy to return cause I feel like if it’s easy to access, easy to return. It will be hopefully, fingers crossed knock on wood, easier to maintain. And, one thing that I have a bad habit of doing, and I’m hopefully, not alone in this but, I do a lot of lesson planning at home. And, I like to just kind of play with the materials and come up with ideas for the kids, at home. And what I’ll do is, I will load down a giant bag, one of those 33 bags, you ladies probably know what I’m talking about. Fill it to the brim with art supplies, and I just drag it back and forth. What I’m starting to do now is to compile a home supply set. That way basically, I have a mirror image of all the supplies that the kids have at school. I also have a set at home. That way, whenever I want to explore with materials I don’t have to drag things back and forth or, I don’t have to wish that I had brought something home, when I’ve already got a complete set there to kinda play around and tinker with. Then, I don’t have to worry about dragging that bag around and returning everything to school. So, those are my three tips. The thing is, is that for the longest time I obviously, for 15 plus years since I’ve been in my school … My current school and, since I’ve been teaching. I have allowed myself to get away with being extremely messy and extremely unorganized. I had it in my head that … And I still believe this. There are some people who are just naturally organized. They can think that way. And you know them when you see them. They’re purse, when they open it, they know where everything is. They’re not digging around like a crazy person like I am, trying to find a pen, which I can never find. What kind of art teacher never has a writing utensil? And they know where everything is. They seem very calm and chill because, everything is so organized. And I just thought, “Wow. What is that life like? That must be that they’re born with it.” It’s something that I don’t have. And I think that’s true. But, I don’t think that I can and maybe you can’t either, use that as an excuse. It just means that folks like us, if you’re like me crazy and organized, it’s just something that we have to work a little bit harder on. And then perhaps, that will be something that will start to come naturally? Probably not. It’s probably always going to be something that I personally, will have to work on. And, when you meet me or see me or bump into me, it’s 100% guarantee I’m going to be carrying 50 bags, and I will not have anything that I need in any of them. But, I don’t know where I’m going with that. The End, basically. But, it’s something that I am working on. And, what better time than the spring? So, yeah. You know, if I could travel back in time and give my college professors a recommendation on a course that would really help art teachers, it would be how to organize your art teacher and space. How to organize your storage closets and how to maybe, buddy up with those people who are of that organized mindset. And that can hopefully, show you the light and show you the magical unicorn way that is organizing a storage closet and keeping your life together. So y’all, I will have to keep you posted. But, if you want to see pictures. You can definitely check them out on my Instagram, where I am starting to tackle one closet and will definitely keep you updated on the progress. Or, you never know, the lack thereof. Thank you for letting me share guys. Tim Bogatz: If you’re an Art Ed PRO member and you are loving this episode. I have the perfect learning pack for you. It’s from Alicia Kaczmerek, and it’s called “Effective Routines for Managing Supplies”. In this learning pack, you can explore strategies for effectively managing and organizing your art supplies. And, learn how to help your classroom run more efficiently. Now, getting and staying organized takes more time that we’d like to admit. And this learning pack is a great place to get started. If you’re not yet a PRO member, you can start a 30-day free trial and make “Effective Routines for Managing Supplies” a part of that trial. You can find that learning pack and 60 others covering a plethora of topics at the artevent.com/pro. Sure Stephanie. I have done a couple of fundraisers. The one that I have done the last two years that I really enjoy is called, “Artome”, and I am not affiliated with Artome and, I am not getting any sort of kickbacks or perks for mentioning them. So, I just want to throw that out there. I have used them for the last two years and, I have nothing but great things to say. So, let me share with you how it works. Your students create a work of art on paper that they send you or, that you can attach to the paper they send you. Essentially, they will send you an enormous stack of paper based on how many students you have, and the paper has a 9 inch by 12 inch rectangle on it. And then, the outside of the paper … The rest of the paper actually, has student information that they need you to fill out. Name, teacher’s name, grade, title of artwork, et cetera. Your students can create artwork directly on that paper but, I have found that the paper isn’t my favorite. It’s a nice, thick paper I just, I like the paper that we purchase better. So, what I do is have my students create their artwork on another 9 by 12 inch piece of paper and then, I have a parent volunteer, she spray adheres it with 3M spray glue to that form paper that they send us. And, I used to also, the parent volunteers and I, would physically fill out each form with 350 students, which I know isn’t very much compared to what you guys all teach. But still, 350 times to write out a student’s name and all of that information, was quite a bit. So recently, my secretary she created the labels for me. So, all we had to do was peel and stick. Once all of your student’s artworks are created. You simply box the artwork back up and, they give you a UPS label, so you do not have to pay for shipping. You send it to Artome located in Georgia. Once it’s there, they take the artwork. They frame the artwork and it’s double-matted in a black frame, kind of a cream colored double-mat and a plastic plexiglass for the front. Then, two weeks later, they magically appear at your school, two Artome volunteers, with these really nice wire racks that they mount all of the artwork on. So, it’s an instant art show. You literally do nothing on the night of the art show, except smile and wave and take some cash-ola for your fundraiser. So, what Artome charges is $19 for the frame and the labor. And then, whatever you upcharge is what you get off the top, that’s your fundraiser. For example, I charged $25. So, I get about $6 in profit, per work of art sold. If you are a person where it’s hard for you to do an art show, or your at multiple schools, this would be killing two birds with one stone because, you would have this beautiful art show. I mean, they do a fabulous job. And, you would also be able to raise some cash. They completely setup the art show and they tear down the art show. I went home and they were still taking the art show down. So, it was pretty stinkin’ amazing. So I, can’t recommend that enough. I’ve never had any hiccups or issues with that company. And the great this is, is that when I do have a question. You can pick up the phone and call them, that’s my very favorite thing. Another awesome fundraiser to use is Art Sonja, I think a lot of us are familiar with Art Sonja. I find however, it’s a continuous labor of love. I have yet to be able to train my students with the one iPad that I have, to get them to take their own pictures and upload it. It’s on my bucket list, my art teacher bucket list. But, I have to do it. Currently, I take the photos and then, I have a parent volunteer come in when she has time. And she just puts her feet up and she sits there and uploads the art work for me. And, that’s a great fundraiser because, it not only gives you funds but, it makes it so that your parents are constantly made aware of the awesome things that are happening in your art room, what their child is creating. So, those are two fundraisers that I love and I’ve used, and that I’ve probably mentioned a couple of times, here. Thank you so much Stephanie for the question. Oh boy, don’t even get me started. How many times have we heard that? I’m putting my foot down because, I know I have used that excuse quite a bit. “No moss.” I tell you, “No moss.” I’m going to put on my adulting pants. I’m going to get my storage closet life together. And, I will be sure to share it with you. In about five to six years. Just kidding! Hope it’s a little bit sooner. You guys have a great week and, here’s to spring cleaning.